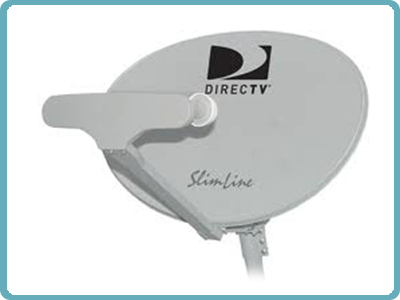 LNB Kit has 1 (4 output) LNB and the new Slimline dish from DIRECTV and all necessary components. This LNB is lighter and better looking. The Slimline encompasses three LNBs to receive 101°, 110°, 119° degree satellite, plus the new Ka satellite (99°, 103°) for local HD MPEG4 programming. The Dish is: 22.5 in. x 32.5 in. LNB is A low-noise block converter (LNB, for low-noise block) is the (receiving or downlink) antenna of what is commonly called the parabolic satellite dish commonly used for satellite TV reception. It is functionally equivalent to the dipole antenna used for most other TV reception purposes, although it is actually waveguide based. Whereas the dipole antenna is unable to adapt itself to various polarization planes without being rotated, the LNB can be switched electronically between horizontal and vertical polarization reception. The LNB is usually fixed on or in the satellite dish, for the reasons outlined below. The corresponding component in the uplink transmit link is called a Block upconvert (BUC).